Russia began their home 2017 Confederations Cup campaign with a 2-0 win over New Zealand in front of a watching Russian President Vladimir Putin in St. Petersburg. Russia boss Stanislav Cherchesov, who insisted in the lead-up to the tournament that he had no confirmed starting eleven, made three changes to the side that drew 1-1 with Chile in Moscow a week ago. Perhaps the most surprising of those was the inclusion of Dmitry Poloz to partner Fedor Smolov up front. The extra attacking threat provided by two attackers proved too much for New Zealand, whose defense had no answer to the extra space it created. In the tournament’s opening game at Saint Petersburg Stadium and with President Vladimir Putin, FIFA chief Gianni Infantino and football legend Pele all in attendance, Russia made the winning start to the tournament that was widely expected of them against a lower-ranked New Zealand team. Russia coach Stanislav Cherchesov started with an attacking-style line-up and the decision paid off as Russia started the brighter of the two teams and put New Zealand under near-constant pressure in the opening exchanges. After the New Zealand ‘All Whites’ had cleared off the line several times, the breakthrough for the hosts came on 31 minutes when midfielder Denis Glushakov raced through into the box and chipped the ball over Kiwi ‘keeper Stefan Marinovic. Several defenders rushed back to attempt to clear the ball, but after coming off the post it was bundled over the line by defender Michael Boxall. The hosts continued to crank up the pressure after the break, forcing the impressive Marinovic into a fantastic double save, but Russian pressure finally told when Krasnodar striker Smolov - top scorer in the Russia Premier League for the past two seasons - tapped home from an Aleksandr Samedov cross on 69 minutes. New Zealand rallied briefly and midfielder Ryan Thomas forced Russian keeper Igor Akinfeev into a smart save, but in reality Russia ran out comfortable winners and could have added more goals late on. It was a game Russia were widely expected to win against a New Zealand team that are Oceania champions but are the lowest-ranked nation in the tournament. In the post-match press conference, goalscorer Smolov had a chance to show off his English when the connection to the translator in the press conference went down. “It’s always good to win matches in such a big tournament, and for us it’s very important that the people in the country fall in love with the national team during this Confederation Cup,” he said. Cherchesov joked that Smolov’s language skills were the “first step to England” for his charge, who had been linked with a move away from the Russian Football Premier League. 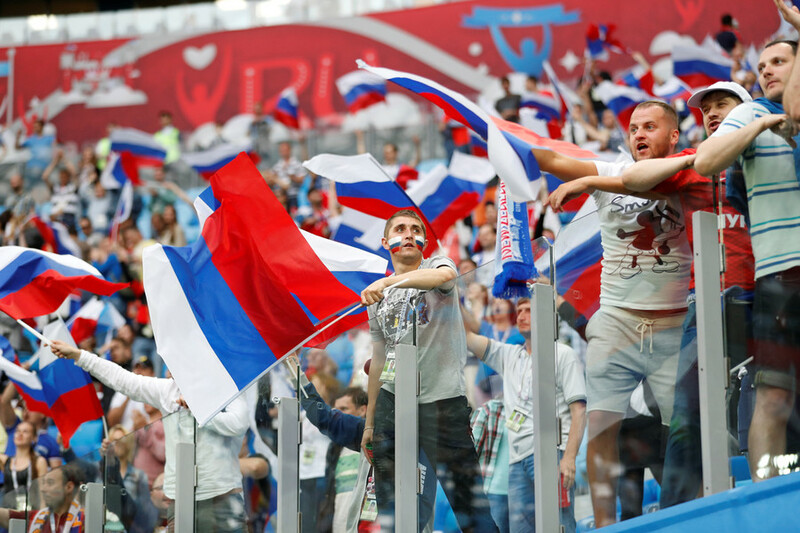 Answering the question whether the result had taken any pressure off his team, Cherchesov said the only pressure may have been from Russian President Vladimir Putin’s speech before the game. “Take pressure off is a medical term. There is no pressure. We have done what we have planned, yet it may have looked as though New Zealand were not ready in the first minutes,” the former Russia goalkeeper said. New Zealand coach Anthony Hudson expressed pride in his team, but also praised what he said was a “very strong” Russian side. “I feel slightly deflated. We lost the game 2-0 playing against a very, very strong Russian team. I thought they were good tonight. But overall we showed a lot of spirit, a lot of positives to take into the next game. Ultimately, we got beat by a very good team tonight,” he said. Russia will face sterner tests in their next two Group A matches, with Cristiano Ronaldo's Portugal up next on Wednesday in Moscow, followed by CONCACAF kings Mexico on Saturday. The FIFA Confederations Cup is being played in four Russian cities - Moscow, St Petersburg, Sochi and Kazan - and brings together the six FIFA continental champions, as well as the host nation and the World Cup winners.